Because we are so committed to safety at Carroll Garage Doors, we make a point of advising customers to always let the professionals handle garage door repair Granada Hills CA. This is especially important for customers needing garage door spring repair Granada Hills CA. Broken springs are still under tremendous tension, and removing them can be a very risky business for unqualified people. Our certified technicians, on the other hand, can remove and replace broken springs quickly and safely. We frequently work with brands like Amarr, Unique, Liftmaster, Wayne Dalton, and Genie, and our technicians can do warranty repairs. 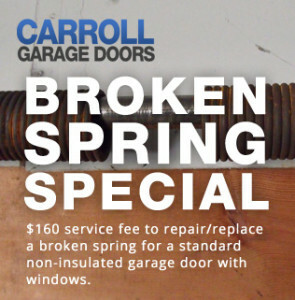 When you call Carroll Garage Doors, you can expect to receive expert advice and service every time.